LiveCode LessonsData GridLiveCode Data Grid Data Grid FundamentalsWhat Is This "Data Grid Templates" Stack That Appeared in My Project? A data grid relies on record templates (forms) and column templates (tables) to display data. These templates are merely LiveCode controls that will be used to visualize your data. In order to manage these controls the LiveCode IDE creates a stack named Data Grid Templates the first time you add a data grid to a card in your stack. This stack contains a single card for each data grid you add to a stack. Each card contains the template(s) and behaviors that the data grid will use to display the data. 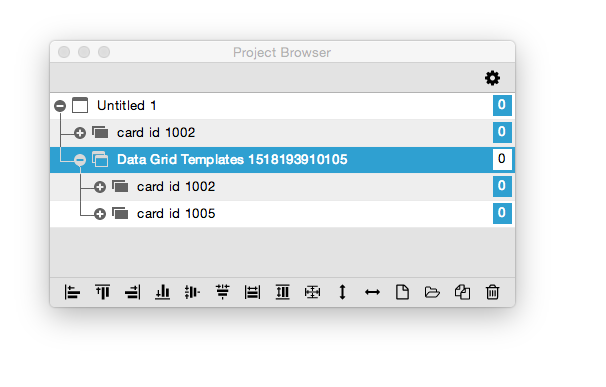 This screenshot shows some controls that might appear on a Data Grid Templates card. The Row Template (1) is the group that contains a) all of the controls for a form or b) the column templates for a table. The IDE assigns the Row Template group to the dgProps["row template"] property of the data grid. 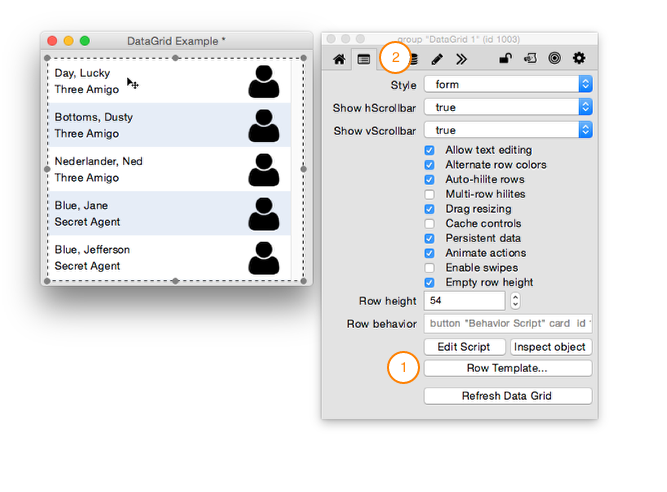 The Behavior Script button(2) is assigned as the behavior to the Row Template group and is used for data grid forms. This script controls how data is inserted into the Row Template controls and how those controls are positioned. 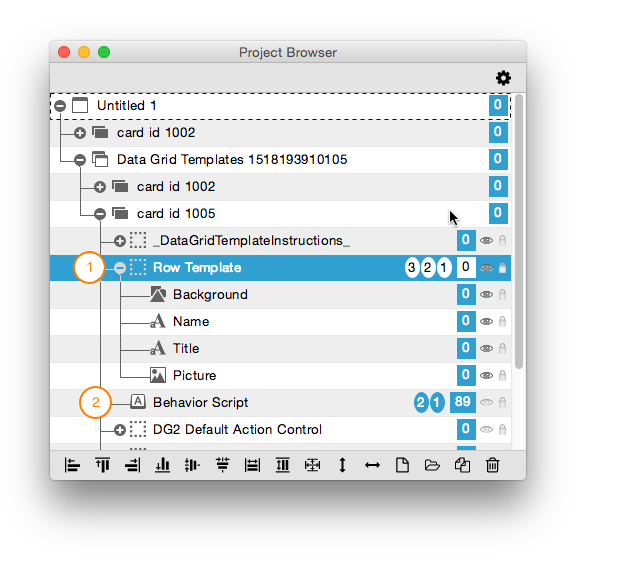 The LiveCode IDE makes it easy to locate your templates in the Data Grid Templates stack. Simply select the data grid control and click the Row Template button (1) in the Data Grid (2) pane of the inspector. The card containing the template(s) for the selected data grid will open. 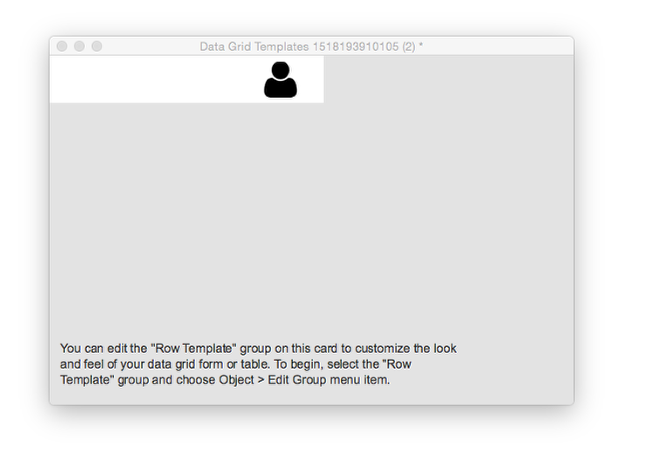 Next: What is a Row Template?